On this date in 1676, Antonie van Leeuwenhoek wrote a letter to the Royal Society describing “animalcules.” They met his claims to see microscopic creatures with skepticism, but today we know that the creatures he saw as protozoa. The longlist for the National Book Award YA Lit has been announced, and includes some great SFF picks, like Kate Milford’s Greenglass House, Andrew Smith’s 100 Sideways Miles, and John Corey Whaley’s Noggin. This is the first time I’ve heard of these books and now I’m itching to read them, especially Greenglass House. I heard of the KGB Fantastic Fiction series a while back—it’s a monthly reading held at the KGB Bar in Manhattan, and it sounds amazing (doesn’t hurt that Ellen Datlow co-hosts it). Well, I just found out that you can listen to audio from the reading here, for free! The concept art for this comic adaptation of Michael Moorcock’s ELRIC series looks incredible; I can’t wait to read it. Interested in reading Robert Jackson Bennett’s City of Stairs after reading Marion’s review of it? Tor has an excerpt online, as well as a great interview with the author himself, where he discusses his move into fantasy. I found a beautiful poem this week. It’s called “Fairy-tale Logic,” by A.E. Stallings. Enjoy; it’s gorgeous! John Scalzi is about to be all over TV. Lock In has been purchased by Legendary TV for adaptation into a series; and SyFy is developing Ghost Brigade based on Scalzi’s OLD MAN’S WAR series. io9 reviews a new book about the original Star Trek, entitled These Are the Voyages, and reveals several odd behind-the-scenes facts about the show. Did you know the show owes its existence, in part, to Lucille Ball? Now you do. Mark Gatiss did a Reddit AMA recently, in which he admits that that playing Mycroft inspired him to start running and ghosts are his favorite food. Ghosts! 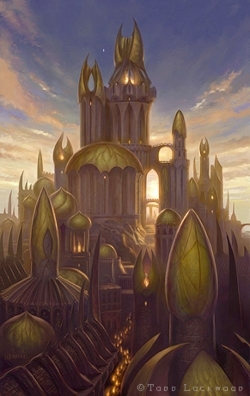 I’ve been a fan of Todd Lockwood’s art since I saw it on the recent Marie Brennan LADY TRENT novels. 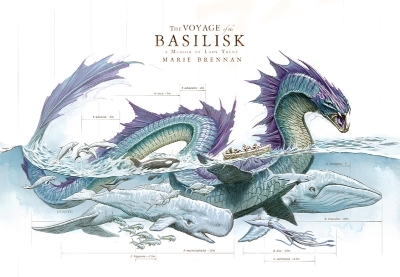 I knew his dragons were incredible; I especially loved the cover for Voyage of the Basilisk, showing the dragon to scale next to lots of gorgeous illustrations of marine creatures. Then, a few weeks ago, I stalked his booth at Dragon*Con and fell even more in love with his work. His work is a window into world upon world. 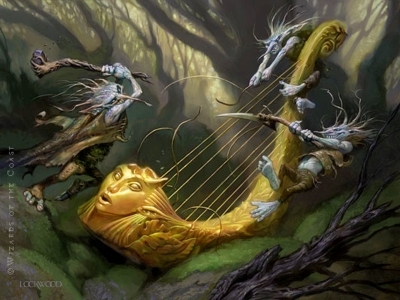 What’s the story behind “Wrecking,” the painting of the evil smallfolk ruining the golden harp? How about his take on “Green Man”? 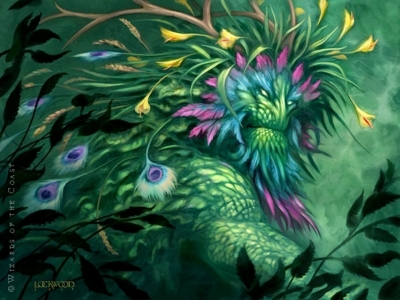 I never knew a creature with lilies and peacock feathers growing out of its head could be menacing. Lockwood’s illustration work has appeared on NY Times best-selling novels, magazines (such as Asimov’s, Analog, and Realms of Fantasy), video games, collectible card games, and fantasy role-playing games (like Dungeons and Dragons). It has been honored with multiple appearances in Spectrum and the Communication Arts Illustration Annual, and with numerous industry awards. Always known for the narrative power of his paintings, Todd now turns his hand to writing, and is working on a novel to be published by DAW Books at a date still to be determined. (How cool is that!?) You may view his art at his website, http://www.toddlockwood.com, keep up with him at http://www.tolo.biz, or get chummy at http://www.facebook.com/artoftoddlockwood. ‘Wrecking’ and ‘Green Man’ are both art for Magic: The Gathering cards. Gleeful Sabotage and Walker of the Grove respectively. Thanks! The titles I assigned them were from their image names on his website; I like the titles you name even better. I’m so enchanted with Walker of the Grove.